With the finals only a day away the Celtics and Lakers are everywhere. Players now and players then are being quoted and photographed everywhere. Yesterday, NBA Living Legends and former Converse endorsers Magic Johnson and Larry Bird did a conference call/interview. Personally, I think they saved the best question for last. Even though neither of the two have a working relationship with Converse, it was amazing to read what they had to say. Which I will pass on to you today. Q. Can you talk about the Converse commercial you shot. You both mentioned you didn't have a personal relationship before. Tell me how that changed, how your relationship has grown since then. MAGIC JOHNSON: The great thing is his mother could cook very well (laughter). We were standing there. We went up to Larry's house. His mother cooked lunch. We had a great time. We had never really talked for any length of time. When we went up to his house, also we were standing in between takes, we were able to start talking, and lunchtime, we were able to talk, get to know each other. We were both from the Midwest. Both from families that are close. I really got to know him as a man, not just the great, great basketball player. I think it changed my view as far as Larry is concerned. I've always had the highest respect even back when we played in the world games when Hall didn't start either one of us. Remember, Larry, we killed the starters. We were on the second team and we always beat the starters in scrimmages. I'm glad I finally got a chance to know him, him and his wife, his family. He got to know me. Now we're getting ready to come out with a book together next year. So we've been doing things and keeping in contact with each other. Larry is a good friend. Have nothing but the highest respect and love for him. 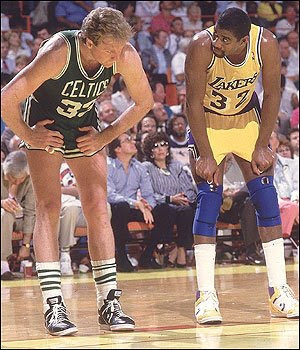 LARRY BIRD: You know, back in '84 when we shot that commercial, we really didn't know each other. We played in one All-Star Game together. When the ball went up, when we played against each other, everything was off. I mean, we were competitive. We wanted to win. We did whatever we had to do to get ourselves prepared. I know in the summertime, no matter how we finished up, I geared everything to playing The Finals against the Lakers. That's how I spent my summers. You hear guys going out and having dinner together before the games. That was never gonna happen, believe me, because we were too competitive. Leave all that stuff for the summertime. We did get to know one another. I had a lot of friends of mine were big Magic fans, thought he was the type of player you'd never be able to see again. I had so much respect for him, how he handled himself, how his teams played. He was the man with the ball. He was making the decisions. It all started in '84 and it's carried on now to 24 years later. You can read the complete interview over at Inside Hoops. I am out for today, I've got to rest up for the finals, or something like that. Either way, thanks for checking out the blog and please remember to vote in the poll.